Open & Close your garage door from anywhere win the world with your smartphone devices. Receive instant live alerts when the garage door is opened or closed. 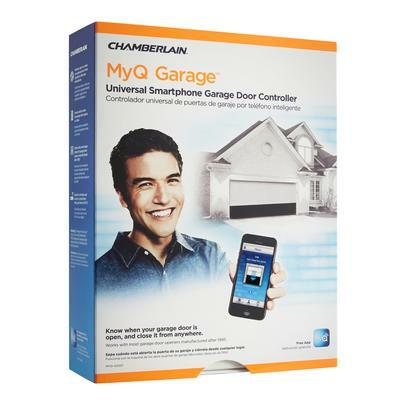 With Chamberlaiin`s MyQ Garage door controller we can turn your smartphone into a garage door opener. All We need is Wi-Fi and you are in business. Get rid of the remotes people typically leave in the car allowing anybody to access your garage door just by pushing a button. Image being able to let the gardner in to grab a bag of soil while you are working downtown that you control via your smartphone phone device. The Chamberlain MyQ Home Control App empowers you to easiliy and confidently monitor and control your home from anywhere. MyQ technology brings you peace of mind, security and full control when you forget to close the garage door or want to open it to accept a package that you need droped off at your home. And with push notificaiton enabled, your smartphone will know when the door is closed and opend from anywhere in the world you have internet access. Know When Your Kid`s have come home from school as they enter via the garage door. Open, close and monitor your compatible Chamberlain garage door opener from anywhere using your smartphone - have peace-of-mind that your garage door is always closed.